Annan’s title hopes took a severe dent at Galabank after Montrose staged a remarkable come back in a game where they looked dead and buried, trailing 3-1 with only six minutes left Annan conceded 2 late penalty kicks which were both converted to earn Montrose a share of the points in a match which they looked consigned to defeat. 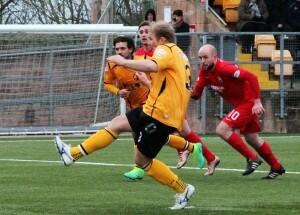 It was the visitors who settled in the quickest against an Annan team who struggled to put many passes together. Chances were few and far between at both ends. It was however Annan who created the first real chance when Flynn finished a well worked move with a volley which went narrowly past the upright. This was followed minutes later when Jordan Morton’s well struck shot was well saved by Tokardcyk . Montrose stunned Annan when they opened the scoring in the 32nd minute, Gary Fraser did the damage brushing aside Jago to end with a dangerous cross ball and Adrian Mallagary running in on goal managed to slot the ball over the line from close range. Annan responded when Flynn finished a promising move with a low shot. The visitors appeared to be heading to the interval with their slender goal lead when Annan squared the game in the dying minute of the half. It was a wonderful low strike from the edge of the box when Ryan McStay picked the ball up from McNiffs throw in and his crisp shot flashed past the outstretched arms of Tokardcyk to nestle in the corner of the net. Annan upped the pace in the second half and it came as no surprise when they went ahead from the penalty spot in the 57th minute. The incident leading up to the penalty kick saw Flynn being taken out on the edge of the box by Martynuik and Bryan Gilfillan converted from the spot to give Annan the lead for the first time in the match. Montrose were finding it difficult to contain Annan at this stage and it came as no surprise when Annan increased their lead in the 75th minute. It was a well worked goal down the left with McNiff heading the ball into the path of Smart Osadolor who picked out Flynn with a well placed cross which saw Flynn scoring from close range to give Annan a comfortable two goal cushion. Montrose at this stage looked a beaten side but they got a foothold back into the game in the 82nd minute when Ross Campbell won a penalty in the 82nd minute after driving forward with a surging run into the box and Campbell fell under the challenge by Jago . The striker picked himself up to slot the ball into the net. All of sudden Annan appeared tense and nervy and as the game entered the final minutes Montrose won a second penalty when Jago fouled Campbell and Gary Fraser converted the spot kick and Ben Jago was sent off for the challenge. It was a disappointing end to the match for Annan and the 2 points dropped heaps pressure in them to win the mid week game at Berwick on Tuesday evening in a game bottom placed Berwick will be looking to also win to get them off the foot of the table. ANNAN ATHLETIC: Blair Currie, Bryan Gilfillan, Martin McNiff, Kevin Nicoll, Ben Jago , Ryan McStay , Matthew Flynn , Jordan Morton, Josh Todd ,Lewis Guy, Smart Osadolor (Stuart McColm 87 min). SUBS NOT USED: Jordan Hart, Rabin Omar, Greig Mcdonald, Steven Sloan, Scott Norman, Liam Park . MONTROSE : Alex Tokardcyk), Aaron Comrie, Neil Martynuik, James Clark, Andrew Steeves, Terry Masson, Graham Webster (Ryan Ferguson 88 min), Ross Campbell, Adrian Mallagary, Chris Templeton, Gary Fraser, Subs Not Used Greg Pascasio, Adam Haywood, Ryan Kenneth, Declan Milne, Kyle McLeod, Jordan Miller.